Nursing students immunize 11-year-old James Port during a free vaccine clinic organized by the Spokane Regional Health District. Jess Asien never thought it could happen so fast. She was at the gym when she found out her brother was in a coma. She cried in the locker room. She made it to Sacred Heart Medical Center by 3 pm, an hour after her brother's heart stopped for the first time. She and other family members sat at his bedside for the next 15 hours as hospital staff weaved in and out. At 4:30 am, she went home to check in on her children. At 5:36 am, on Tuesday, Jan. 20, her beloved brother Chad was gone. It's been a month now since Chad Rattray died due to complications from the flu, even though the otherwise healthy 37-year-old — known by many for his selflessness and his popular downtown Spokane hot dog stand — was vaccinated against it. Asien should be focused on grieving for her brother, but instead she's enraged. A conspiracy-leaning website called Health Impact News is using his story to spread fears that the immunizations are responsible for flu-related deaths. "This story has had 54 shares, and I'll let the title speak for itself — 'Death by Vaccination' — and it was really upsetting to me," Asien says. "They got this completely wrong, and if they're not doing basic research on what happened to my brother, then what are they doing otherwise?" The debate over vaccines — driven largely by conservative and anti-science groups — has again been thrust into the national spotlight after a measles outbreak linked to Disneyland tourists sickened 171 people across 17 states. This comes as more people are opting out of vaccines across America, during an unusually severe flu season that has taken Rattray's life and hundreds more. Meanwhile, lawmakers in several states are proposing legislation that would prevent parents from not vaccinating their children because of personal or philosophical beliefs. A few states — California and West Virginia among them — are also seeking to remove religious exemptions to vaccines. Early this month, Washington state legislators introduced a bill in Olympia to remove the personal-belief exemption allowing children to enroll in school without proof they've been vaccinated. The bill is co-sponsored by Rep. Marcus Riccelli, D-Spokane, who serves as vice chair of the House's Health Care & Wellness Committee. The family of Chad Rattray is upset that anti-vaccine activists are using his death to further their message. "It's important we do this now, because there is a rising rate of anti-vaccine sentiments in America, and the [measles] outbreak shows how fast these diseases can spread," Riccelli says. "It's not just about ending the human pain and suffering and death, but it's about the unnecessary financial drain on our already strained health-care system" when those who don't get vaccinated become sick with preventable diseases. Inside Centennial Middle School's cafeteria, parents with antsy children sit at long tables filling out consent forms or waiting to be called behind a wall partition for a quick prick in the arm. 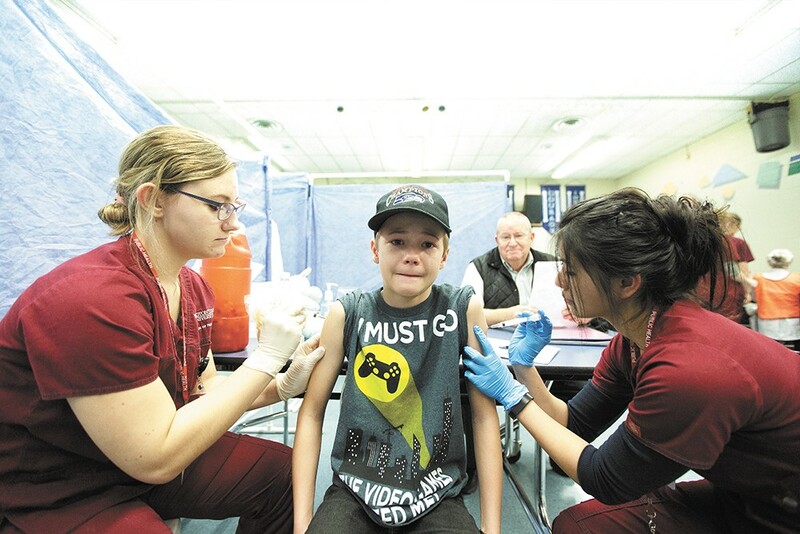 The warmer-than-average Tuesday night marks the first free vaccine clinic of the year organized by the Spokane Regional Health District, with four more to come each month at area schools through May as part of its Immunization Outreach Program. Spokane Valley mother of six Garianne Stephens is here with her youngest, 12-year-old Benton, a student at Evergreen Middle School, for his chickenpox vaccine. "We got a letter in the mail. Otherwise I wouldn't have known. He needs the chickenpox [vaccine] to stay in school, although he'd rather not have to go to school," Stephens says, giving Benton a sideways glance. "It's frustrating to me that kids who don't get vaccines can enter school and our kids are at risk." She has reason to be concerned. Spokane County's vaccine rates are well below the rate that ensures "herd immunity" — between 80 and 90 percent for most diseases. This concept follows the principle that if most people are vaccinated against a communicable disease, when someone in the community contracts a virus like measles, having a high percentage of vaccinated people will prevent it from spreading rapidly. But when more people begin to actively choose to not immunize, the chance of a disease spreading — like the California-originated measles outbreak — is much higher. "One of the concerns nationwide is that people who seek exemptions tend to cluster together, so that really increases their rates of acquiring and spreading disease within their group and to others," says Spokane Regional Health District epidemiologist Dorothy MacEachern. "I think that is happening locally, too." According to data from the Washington State Department of Health, the number of parents citing exemptions for their kindergarteners in Spokane County has been on the rise for the past 10 years. Those rates peaked at 10.9 percent during the 2008-09 school year — just before the now-discredited research paper by British doctor Andrew Wakefield linking the measles, mumps and rubella vaccine to autism was found to be fraudulent. The number of vaccine-exempt students in the county has since tapered off to 6.7 percent during the 2013-14 school year, but nearly 5 percent of those opting out are citing personal/philosophical beliefs. In North Idaho, vaccination exemption rates are notably higher than in Spokane County. Kootenai County has an exemption rate of 10.3 percent, and 18.2 percent of students in Bonner County opted out of at least one vaccination for either personal, religious or medical reasons during the most recent school year, according to health records. MacEachern and her co-workers at the health district are hopeful that legislation to remove those exemptions in Washington is successful. "I think it would really help our community," says Dannette Dronenburg, a public health educator who does immunization outreach for the county. "Half the country doesn't allow that, and Washington is one in 20 that still does." Health officials say the anti-vaccine movement is led by people who have little or no knowledge of medicine — because so few Americans actually contract vaccine-preventable diseases anymore. It's the "vaccines-as-a-victim-of-their-own-success conundrum," MacEachern says. "It's out of sight, out of mind, and parents don't think they're really at risk, but we're seeing they are now. People in lots of parts of the world are clamoring for these vaccines because they see their children sick and dying from these diseases that are not gone from the earth." As she sat by her brother's hospital bed and watched machines keep him alive, Jess Asien was torn. She knew being there was putting her two sons, Bodhi, 7, and Rohan, 3, at risk for catching the horrible flu strain that ended up killing Rattray. At the same time, she needed to be there for him during those last moments, even if he wasn't aware she was there by his side. "I was terrified, and it was hard to make that choice to be there with my whole family," she recalls. After Chad died, neither Asien nor anyone else in the family felt compelled to share their personal views about vaccines, but now that bogus websites are using their tragedy to spread a false medical message, Asien has changed her mind. She knows several mothers in her social circle who are anti-vaccine, but she is of the completely opposite viewpoint, and both of her boys are fully vaccinated. Deer Park Elementary, 1500 E. D St. The measles are back in Spokane County… what now?